You use your garage all-year round, and often use it several times a day which is why garage door maintenance is important. The Family Handyman reports the average garage door goes up and down more than a thousand times a year! Garage doors have several moving parts, and like any other household item, needs to be kept up and maintained in order to keep working properly. If you decide to maintain your garage door, please make sure to work safe- shut off power to electronic garage openers, and if your garage door is opened, make sure there is something preventing it from falling. Never remove a lift cable while a door spring is under tension. To keep your garage door working like new, there are several preventative maintenance items that homeowners can do. If you don’t feel comfortable checking any of these items, please contact us for more details. 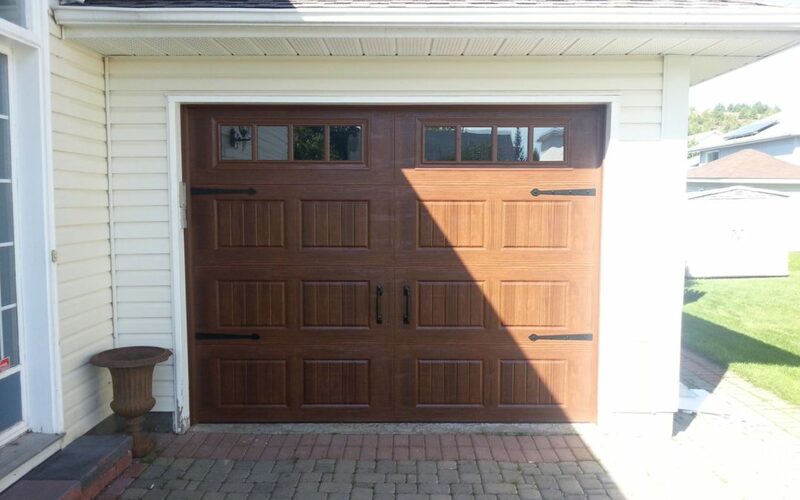 If you keep the parts of your garage door greased, it will help with the ease of use of the door, and help the door to stay operating for many more years. Not sure what to use on the garage door parts? Spray lubricant to coat the overhead springs. Garage door hardware can loosen from the movement and vibrations of opening and closing the garage door. Check the roller brackets and bolts and if needed, tighten them with a socket wrench. Check the bottom of your garage door to see if the rubber weather seal strip is brittle or cracked. If it does need to be replaced, make sure to do this right away to keep the cold and snow out of your house. To purchase weatherstripping, visit your local home improvement stores. To add the weatherstripping, simply cut to the proper size and insert into the door grooves with the wide angle of the flange inside the door. Simply looking at your garage door in action every time you use it is a great way to see if it appears to be working well and moving smoothly. Check for scraping or grinding noises and see if the springs, pulleys and cables look symmetrical. Check all the cables and for broken strands and damage near the bottom roller bracket. For safety purposes, make sure not to tinker with high-tension cables. Inspect the rollers; worn, or cracked rollers should be replaced as soon as possible. Examine the door itself, for water damage and warp, as well as chipped and peeling paint. You may need to sand, prime and paint steel doors that have rust spots. Wash the door regularly with a mild all-purpose cleaner. Check for any broken springs and cables on the garage door. Make sure to check the tracks on each side of the door and ensure they are free from debris that could cause damage to the door. Keep in mind that any major track adjustments should be done by a garage door technician. Your garage door is important to keep your garage safe and clean, and to keep everything stored inside it protected. Make sure to check the door regularly for proper operation and if you have any concerns, contact a professional garage door company.